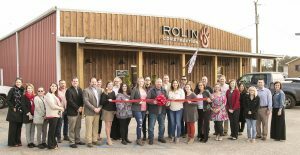 The Atmore Area Chamber of Commerce held a ribbon cutting for Rolin Construction, Thursday, February 14. Chamber board members, friends and family joined the owners and employees for the occasion. Shown are, from left, Emily Wilson, Dale Ash, Brandy Jones, Leslie Henderson, Shawn Rounsavall, Jeff Blanchard, Seth Smith, Leilani Mason, Amber Turk, Emilee Waters, Angela Turk, Jessica Rolin Bailey, Freddy Alvizo, Shawn Rolin, David Chapman, Stephanie Rolin, Brandon Beachy, Candace Sells, Jessica Martin, David Strawbridge, Erin Hankins, Anthony Wiggins, Anna Marie Gilchrist, Megan Young, Kelly Cravens, Kevin Garrett, Brandy Giger.